I love using natural tamarind from scratch in most of my recipes. And this means that I go through the process of cleaning washing, soaking and straining the tamarind before it is ready to use. But, there are those times when I need those quick fixes too. 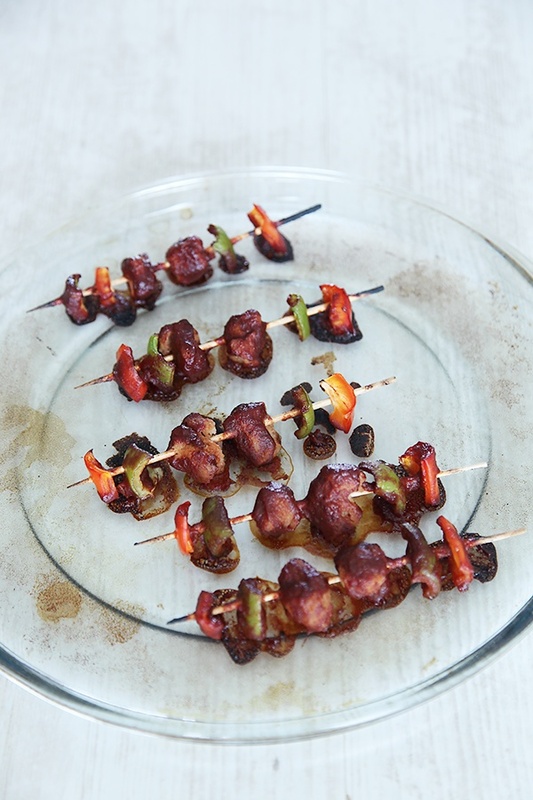 When ADF Soul approached me to use one of their products, I chose their ready made farm fresh tamarind pulp to make these “Tamarind Glazed Soya Chunk Skewers”. These skewers come together quite quickly! You just need to have the ingredients on hand. The sauce seeps into the soya chunks and gives it great flavour and taste, making it perfect for vegans and vegetarians who relish a meaty texture in their meals. And the best part for me was to see my six year old son lapping these up! The regular visitors here, would know about his fussy eating habits, so this recipe definitely scores brownie points from me. 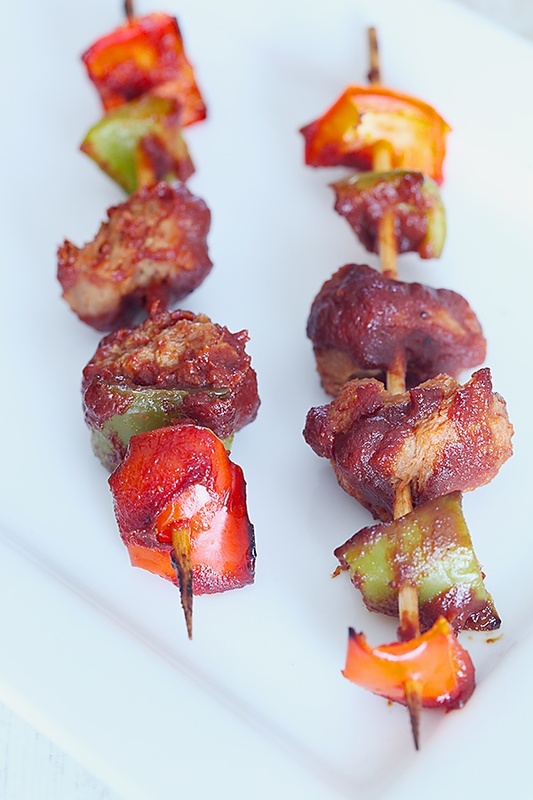 These skewers can be served as an appetizer or starter or even as a snack. At home, they would make a delicious grub to eat when relaxing on a couch and when served in a party, they would make a beautiful picture until they disappear from their plates. The tamarind is the real hero of this dish. The tart flavour of the tomatoes is intensified by the Soul tamarind pulp. 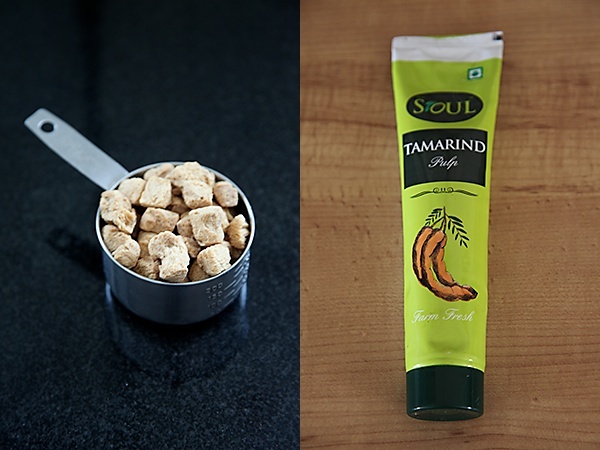 The ADF Soul Tamarind pulp is smooth and has a good tart flavour, which is a prerequisite to get a smooth sauce for the glaze. It was really exciting to be a part of the #KitchenBattles campaign from ADF Soul and interact with my friends and followers on Twitter and Facebook. There were many interesting options for me to choose from, to make soya chunks interesting. I developed this recipe as I felt it can be enjoyed by vegan, vegetarians and others who dont have any dietary restrictions. 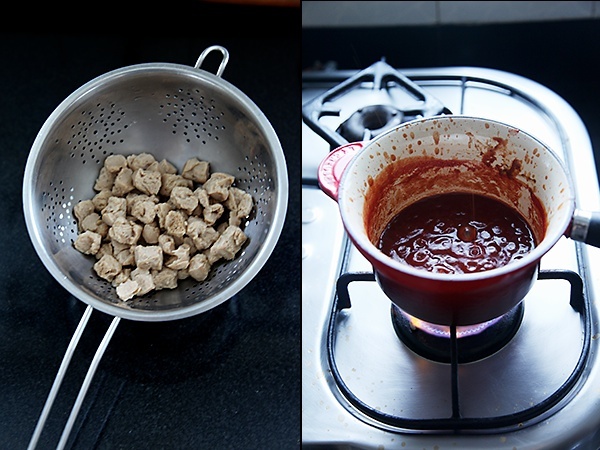 The tamarind pulp from Soul helped me to develop the flavourful sauce for this recipe, that makes soya chunks taste delicious! 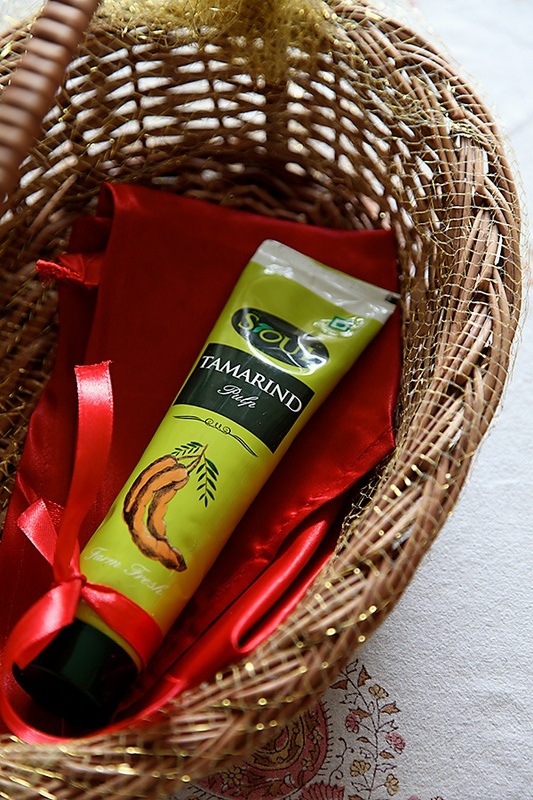 You can use the Soul tamarind pulp in all recipes that call for tamarind and this would be particularly great when you are hard pressed for time, as you wont have to go through the task of cleaning and preparing the tamarind for use. You can buy Soul Tamarind Pulp from here and here. 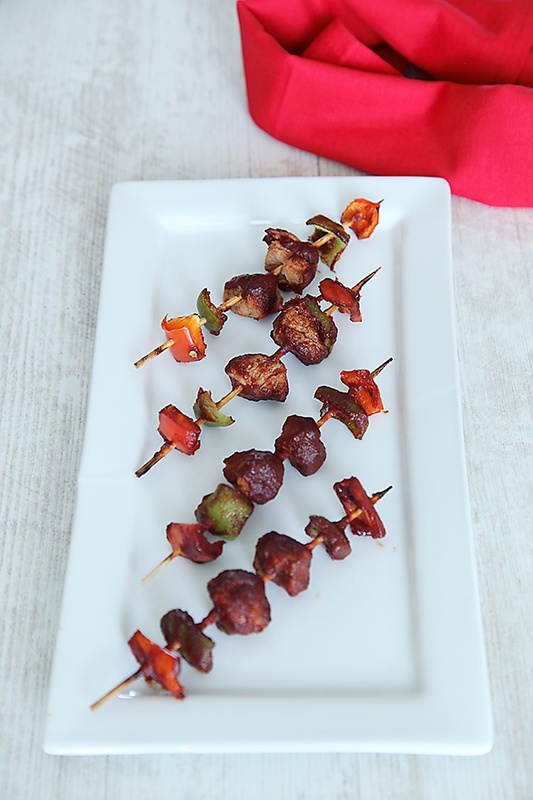 And last but not the least, watch how to make these scrumptious skewers in the video below. P.S- This is a sponsored post as part of the #KitchenBattles challenge from ADF Soul! Prepare the soya chunk as per packaging instructions, drain and keep aside. In a saucepan put in the tamarind paste, the tomato puree, soya sauce, mustard powder, brown sugar, paprika and salt and coo for 4 to 5 minutes, until the sauce is thick. 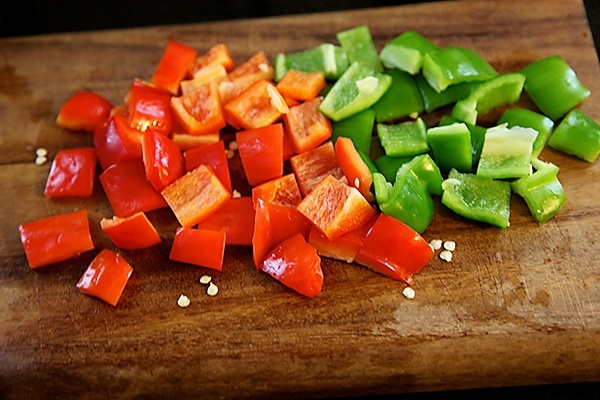 Allow the sauce to cool down a bit and then mix in the prepared soya chunks and the cubed red and green bell peppers and marinate for 10 to 15 minutes. 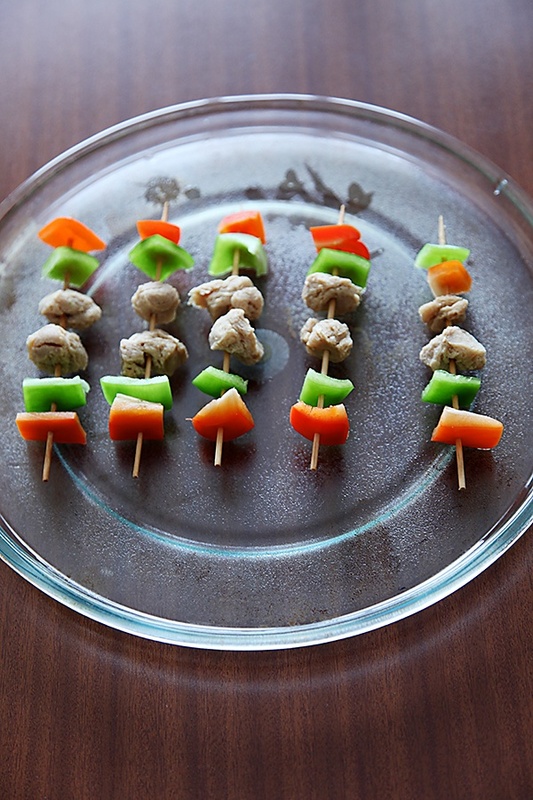 Thread the soya chunks and the bell peppers into the prepared skewers. Place them in 200C oven for about 20 minutes, turning them once in between. I love you website and follow you regularly, I had a question, can we make this in the counter top toaster? Surya- You can make it on a gas grill or skillet if you don't want to put the skewers in the oven. Coral crue- I have two shows on Rajshri Food Channel on YouTube. One is called Divine Taste With Anushruti and the other is called Kiddies Corner With Anushruti. Love your blog easy to prepare and yummy to our tummy. I will prefer easy & variety dishes for my family.